William Martin (1772 – 1851) was the oldest of these famous brothers of the Regency. More siblings were on the way so he was sent to live with his grandparents at Haydon Bridge on the River Tyne, flowing northward toward the “miry court” of beloved Crichton Castle. He seemed to follow in his father’s footsteps, trying a variety of occupations beginning with that of tanning hides. This diverse interest perhaps led him to practice what he best became known for. The Regency was a time of increasing strides made in reducing the cost of labor. Why not a machine that produces its own power, without regard to friction or absence of external force? William was entranced by the notion. He was not particularly of a slovenly nature, but he had warmed to the idea of something that would work without being prodded to do so. Art imitating life. Anyway, he was unsuccessful. His perpetual motion machine, optimistically named Eureka, was dismissed because it incorporated external force–a big no-no. Concealed in its design was an air tube through which force was applied secretly to power a seemingly effortless machine. 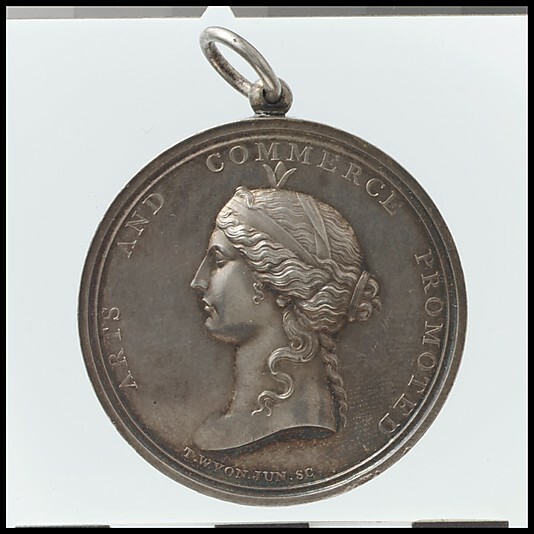 No matter, his spring weighing machine brought him a Regency honor in 1814–the Isis medal from the Society of Arts–a recognition that he was a serious inventor. He soon had reason to habitually wear the thing about his neck. He had become a “stout, portly man, perfectly cracked but harmless.” His well-known diatribes against Newton’s Theory of Gravity completely negated his contributions to science and many thought his proper place was among the British Society of Asses. This entry was posted in Regency, Uncategorized and tagged Crichton Castle, Eureka perpetual motion machine, Isis Medal, River Tyne, William Martin by Angelyn. Bookmark the permalink. Oh, I love this post! (Especially the thermodynamics quote.) Thank goodness the wife supported this crackpot, otherwise we probably wouldn’t know anything about him. The wife’s story might be really interesting….you think?? I agree–she must have been one heck of a dressmaker to keep his projects fully funded. Saved by a woman. It’s sad he lost it in the end. Great post. I tweeted even though you’re link is gone. You’re a sweetie, Ella–I finally got the buttons back. I have to give him credit for trying!